Thank you for taking the time to review our unit description. If your dates are not available please see our other listing # 3716907. I offer lowest rate guarantee !! If available I'll beat any comparable price for a 3 bedroom suite. Ask about our rate guarantee !! Welcome to our luxury suite featuring designer Tommy Bahama style furnishings and decor. Experience all the luxuries and small comforts of home such as full kitchen and in-room washer/dryer. Our Master Bedroom is spacious and elegant featuring King size bed, TV and DVD, a Jetted Whirlpool tub and Large separate shower stall as well a walk-in closet and safety deposit box.. Second Bedroom has 2 Double Beds and a TV. Third Bedroom has a Queen size bed and a TV. Living room has a Queen size Sleeper sofa with TV and DVD Player. Balcony offers pool view. Enjoy the sunrise from the balcony. Unit is flooded with Florida Sunshine,so take that in. The resort’s spectacular interactive zero-entry pool is awesome! An authentic looking derelict pirate ship complete with shooting water cannons and water slide to excite and entertain kids, highlights the colorful, tropical themed pool. Jacuzzi style hot tubs, tumbling waterfalls, poolside Tiki bar, loungers and hammocks await your enjoyment. Reflections spa, a world-class, health spa offers a diverse menu of spa services in a serene setting to pamper, indulge, and rejuvenate. Unique, full service skin and body care treatments as well as therapeutic massages are waiting for you. What a way to relax after a busy day. ** Gator Meet and Greet - meet a real life baby gator, 45 minute educational show and $ 5 Gator meet and greet with photo opportunity. ** Making palm prints on a canvas tote. The first Pizza Hut Cafe Express in Central Florida opened at the Resort, coinciding with the nationwide debut of this new pizza hut concept. The 3,000 square foot, poolside restaurant is one of only two locations in the state. The menu includes classic personal pan pizzas, personal primo pizzas, as well as sandwiches, salads and a breakfast menu. The centerpiece of the new concept is an entertainment-style cooking area that allows customers to watch their meals being prepared. Frankie Farrell's Irish pub & grille is located in Resort village. Owned and operated by a former Dublin pub owner, he has recreated some of the elements that make the great pubs of Ireland truly unique. Sporting real Irish pub spirit and decor, Frankie Farrell's is a gathering place where friendly bartenders and servers will make you feel at home. Come enjoy the art of conversation, watch one of the 17 large plasma televisions or just sit back and relax. With 32 taps dispensing such great beers as guinness, mangers, boddingtons, bass and more, coupled with great traditional Irish and american fare, you can enjoy the best of Ireland while in Orlando. Within same resort: Frankie Farrell's Irish pub, Pizza Hut Express, Reflections Spa and Salon, Lani's poolside bar, Sky Kids Club (very popular with kids), convenience store and gift shop. Within two miles, you'll find a wide variety of conventional and ethnic restaurants, offering a great selection of international dining options. Only a few steps from the luxurious resort is over 238,000 square feet of factory direct brand name stores to please even the most seasoned shopper Lake Buena Vista factory stores, one of Orlando's premier outlet malls. With over 50 stores offering incredible savings on national, designer and name brands, there's something for the entire family. Stores offer factory direct, premium quality merchandise savings everyday! Shoppers love our quiet and relaxed village setting with convenient store front parking. You'll be two miles away from Downtown Disney entrance, with SeaWorld four and-a-half miles away, and Universal Studios less than eight miles away. Walmart is 2 minutes away for you to obtain all your basic necessities to stock up during your stay! Complimentary scheduled shuttle service to major theme parks available every morning, with 24 hour advance reservation. For your convenience discounted attraction tickets are available at concierge. We are a self catering resort and do not provide daily housekeeping service, however if requested these services are available at a nominal charge. You do however have plenty of towels in the unit, and a washing machine and a dryer. Pack lightly and return home with clean clothes! I do have access to other units at the resort as well. If you don't see the dates you're looking for on my calendar, contact me anyway! •	Master Bedroom has King size bed, Jacuzzi tub, walk-in shower stall, 27-inch TV with DVD player, walk-in closet and safety deposit box. •	2nd bedroom has 2 Double beds (not those uncomfortable small twin-beds), 20-inch TV. •	3rd bedroom has Queen size bed, 20-inch TV. Kitchen features granite countertops, full-sized fridge, stove, microwave, oven, dishwasher, garbage disposal, small appliances, cutlery and cooking utensils (pot/pans). •	Each unit has individually controlled thermostat (heat and a/c). •	Ceiling fans and alarm clocks in each room. •	All bathrooms have tiled floors, built-in hair dryers, lighted makeup mirrors, and granite countertops. •	Patio set on balcony, ironing board, clothes iron, and vacuum already in the unit. •	Free high-speed wired internet. •	Free cable TV in all bedrooms. •	Frankie Farrell’s Irish pub & grille, Pizza Hut, convenience store and fully-equipped state of the art Fitness Center, Game room located within the resort. •	World famous pirate ship heated pool with slide, and 3 hot tubs. •	Poolside restaurant and tiki bar, lounge chairs, and hammocks with lots of free towels available poolside. •	Purchase discounted tickets to major attractions, right in the main lobby. •	Luxury spa and salon available onsite. •	Fully staffed resort with 24-hour services. •	On-site housekeeping and maintenance. Primarily because of location and the family environment provided by Resort. Located minutes to Walt Disney World® Resort and designated as a Walt Disney World Good Neighbor®hotel, our resort is the perfect spot for your upcoming visit to Orlando.Each room is a condominium style suite with a full kitchen, dining and living room area, private balcony and beautiful bed and bathroom(s). Strolling about the village is a pleasure all by itself. Additional advantage of amazing shopping experiences, pampering spa treatments or a dip in one of the pools for fun and relaxation. Resort offers 2 distinctive pools, one where there is lots of activity for the kids as they can plunge in the pirate ship pool, the other pool is a tranquil relaxing pool whereby one can enjoy a book by the pool side. Our unit offers breathtaking views of the woodlands, panaromic view of the resort entrance and fountain.Our unit baths in sunshine every morning and it is a relaxing experience to sit in the balcony, enjoy coffee and watch the resort activity. toilet, shower, jetted tub, shower, Jacuzzi, toiletries, make-up mirror. We had a blast and will remember for ever! Perfect side of the building because of view of the pool. We liked being on the quieter side also. Store with so much stuff on site. It was nice place with space for every one to have their own room. Our Spring Break trip with our family (ages 2-63) was very good. The resort is conveniently located to shopping & Disney. Only took 10/15 min to get to Disney & grocery stores were less than 5 min away. Although check-in was 4- we were able to use the pool facilities prior to 4– made the waiting very enjoyable. Since this was a March the pools being heated was a nice feature. 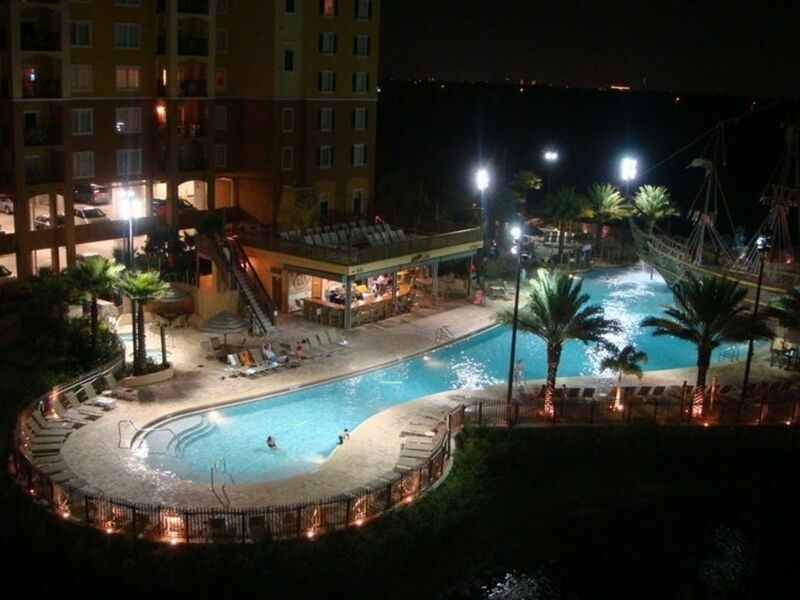 Great place to stay that is very close and convenient to Disneyworld and Seaworld. Unit was clean and as advertised. The unit needed more towels, toiletries, and dishes for the number of guests it can accommodate. The luggage cart was also broken and made move in and out difficult. Overall a great experience and would stay here again! We were very pleased with our accommodations and the staff was friendly. Great value! Our accommodations were great! It was perfect for our trip to Disney World. We wanted to eat a good breakfast before leaving each day so the kitchen worked out well. There was a Walmart close by so we were able to get our groceries there. We rented a Suburban since we had four children who needed car seats. Disney world and Disney Springs were an easy drive for us We chose to not use the free shuttle so that we could be flexible on times. We wish that we would have stayed another day so that the kids would have had more time at the pool and hot tub. The big pirate ship at one of the pools was awesome! We would highly recommend this property for the price! Building 2 does not have enough parking and if you are handicapped like me forget it. Our walk in shower had a crack in the floor. If that water isn't leaking in the room below it there must be a black mold build up under it. The sink and tub both drip in the other bathroom. It is a great location. 2 miles from your front door is the entrance to Walt Disney World. Sea World is located only 4 and a half miles away and Universal Studios is less than 8 miles away. Many golf courses nearby. Paypal (major credit cards like Visa and MasterCard, AMEX) and Homeaway payment accepted. Taxes includes Florida Taxes and Paypal/Homeaway processing fees. Cancellations made within cancellation period (60 days) will forfeit the deposit on the reservation. Prices are subject to change depending on the availability. For most accurate quote, please contact owner.